The Volvo 360c is a conceptual electric car with autonomous tech that Volvo believes is the answer to a more enjoyable life. 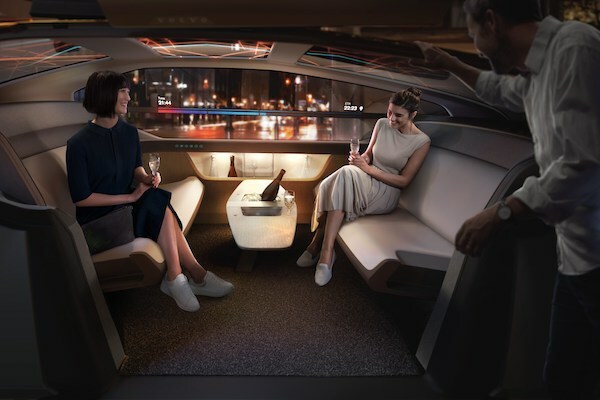 In a trio of press releases issued Wednesday, Volvo revealed a concept electric vehicles with autonomous tech that it calls the 360c, proposing it as a way to change the lives of its users for the better. Volvo presents the 360c as a way for people to rebalance work and recreation in their lives, blending the two into transit to repurpose time normally reserved for commuting. It also proposes autonomous tech for ground travel as a substitute for short-range air travel between destinations 300 kilometers (180 miles) apart or closer. "The business will change in the coming years and Volvo should lead that change of our industry," stated Håkan Samuelsson, president and CEO of Volvo Cars in the automaker's press release. "Autonomous drive will allow us to take the big next step in safety but also open up exciting new business models and allow consumers to spend time in the car doing what they want to do." 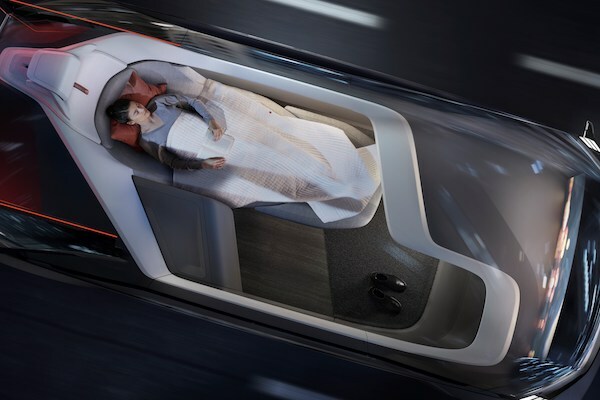 Volvo outlines a belief that autonomous technology in vehicles such as the 360c could become mobile offices, sleeping quarters, or relaxation and social zones. "The 360c explores what becomes possible when we remove the human driver, using new freedoms in design and recapturing time—it's a glimpse at how autonomous drive technology will change the world as we know it," added Mårten Levenstam, senior vice president of corporate strategy at Volvo Cars. "The possibilities are mind-boggling." 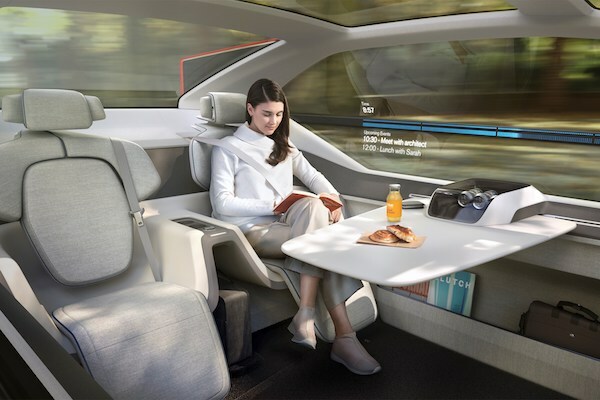 Volvo also points out that autonomous ground travel can eliminate much of the inconveniences integral to air travel, such as waiting times and security checkpoints. It could also free travelers from everyone's least favorite part of travel: Cramped airline seats. "Domestic air travel sounds great when you buy your ticket, but it really isn't. The 360c represents what could be a whole new take on the industry," continued Levenstam. "The sleeping cabin allows you to enjoy premium comfort and peaceful travel through the night and wake up refreshed at your destination. 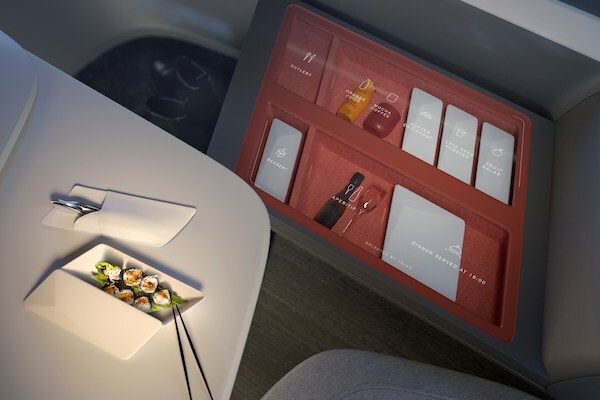 It could enable us to compete with the world's leading aircraft makers." In order to make the fantasy of autonomous driving tech feasible on the unpredictable roads of the real world, Volvo believes a standard system of communications is needed to make definite what an autonomous vehicle will do next. Volvo proposes a series of visual and audio cues to accomplish this, and hopes other automakers will see the sense in standardized safety communications and adopt similar cues themselves. "We strongly believe this communication method should be a universal standard, so all road users can communicate easily with any autonomous car, regardless of which maker built it," explainedd Malin Ekholm, vice president at the Volvo Cars Safety Centre. "But it is also important that we do not instruct others what to do next, in order to avoid potential confusion. Our research shows this is the safest way for fully autonomous cars to communicate with other road users." Clear communication with other vehicles on the road as well as pedestrians is instrumental to making vehicles with autonomous technolgy coexist with unpredictable, human-driven vehicles. Errant human drivers as well as other obstacles present a challenge to the designers of autonomous vehicle tech as Toyota found in a study, and Apple in a crash. The Volvo 360c is just a concept car, however, and the technologies required to make Volvo's dream a reality don't yet exist. Most mass-production electric vehicles due to hit the market within the next few years don't have the battery capacity to allow overnight travel, with many limited to somewhere between 200 and 350 miles of range for approximately six hours of travel at common highway speeds, and less on faster roadways or with smaller batteries. Additionally, autonomous driving is a far cry from the partially-automated driving assist suites of the modern day, such as the often-misunderstood "Autopilot" feature offered on Tesla vehicles. The difference between semi-automated driving and autonomous driving is far grander than it may seem on paper, and is a topic on which it's worthwhile to stay informed. Volvo is under no delusion that the 360c as imagined is possible with today's technology, and that the dream won't be realized until well into the future. "We regard the 360c as a conversation starter, with more ideas and answers to come as we learn more," concluded Levenstam.